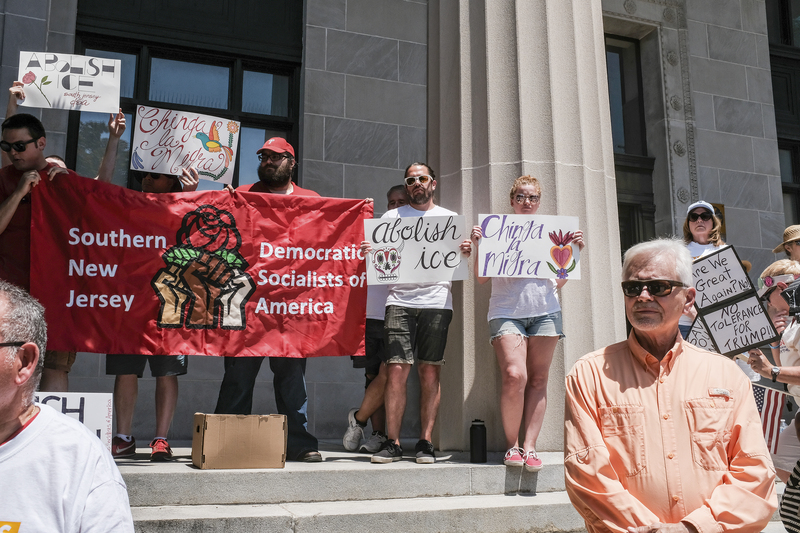 Image caption: Southern New Jersey Democratic Socialists of America (DSA) protest against ICE. The “suburban-urban divide” has long been a scapegoat to oversimplify the differences experienced between urban, city neighborhoods and more suburban communities. Suburban communities are painted by elitist, urban scholars and media sources alike as static, unchanging landscapes that cannot catch up with the “more progressive” cities and their politics. This division was played out heavily in the media in the weeks following the election of Donald Trump, as news source after news source claimed that “rural America” had gifted Trump the presidency. As always, the reality of life for rural and suburban neighborhoods is much more nuanced than those headlines. As socialism becomes increasingly visible in the United States, and Democratic socialist candidates like Alexandria Ocasio-Cortez generate wins in state politics, we must remember that socialist and leftist movements are organizing in suburban communities just as steadily as in urban ones. Because of these outdated views about suburban organizing, some leftist movements forget that less urban parts of the states need organizers too, to the devastation of coalition-building and cross-community support. Indeed, organizers from suburban parts of the Philadelphia area were quick to highlight the faults in such an opinion. While fighting capitalism is a common issue for both urban and suburban socialist organizations, the organizers I corresponded with highlighted specific issues in their communities that they were fighting against and organizing around. Caity C., an organizer for the South Jersey DSA, stated some of their major focus issues as reproductive justice, anti-imperialist organizing, socialist and feminist educational workshops, and the Fight for $15 movement. Hamer highlighted eco-socialism and halting fracking and pipeline construction as important organizing issues for the BuxMont DSA, along with fighting for the elimination of cash bail at the local level and supporting larger movement issues like Medicare for All and Fight for $15. Immigration and anti-ICE organizing were a common focal point among all three organizations. The Bucks County Socialists and BuxMont DSA described how they worked together to help defeat the 287(G) program — a program that would have essentially deputized the local police to act as ICE agents — in Bensalem Township. These ideas of isolation and alienation in suburban cities were another common thread mentioned by organizers. “I think that suburban organizing allows us to organize with those that are normally left out of leftist movements,” Eli S. (Bucks County Socialists) remarked, “not because capitalism is any less terrible in the suburbs … suburbia is truly a horrifying reflection of late stage capitalism, and the alienation is possibly even greater than in urban areas due to a lesser perceived sense of community.” Alienation (one symptom of the damages brought on by late stage capitalism) is clearly present in both the structural makeup of suburban cityscapes, as well as the disconnection of communities in and around neighborhoods. The greater the suburban sprawl, the greater the possibility for a sense of separation. The folks from South Jersey DSA, BuxMont DSA, and Bucks County Socialists all cited base-building and coalition building as vital components to their current and long-term socialist organizing strategies. Only by supporting each other’s organizing goals and sharing in the burdens of creating change can we move forward and continue to disrupt and dismantle capitalism, racism, heteropatriarchy, and the various other systems of oppression that those in power seek to maintain. As we consider this question, we must also consider how, why, and where socialism has been allowed to thrive, or conversely, it has been stamped out. We should consider the past and present, local and national, suburban and urban, across space and time to nurture the alliances and coalitions that will help us build the communities, nation, and world we seek to live in. “The future is full of possibilities; unfortunately, the brightest time to a be a leftist is coinciding with some of the darkest days in recent American history,” Hamer added. Writer’s Note: A huge thanks to Hamer from the BuxMont DSA, Melissa, Nick, Kurt, and Eli from the Bucks County Socialists, and Caity from the South Jersey DSA for their inspiring and insightful answers to my questions. Please support our comrades and the work they do outside of Philadelphia! We are stronger together, even across cities, counties, states, and countries. Solidarity!